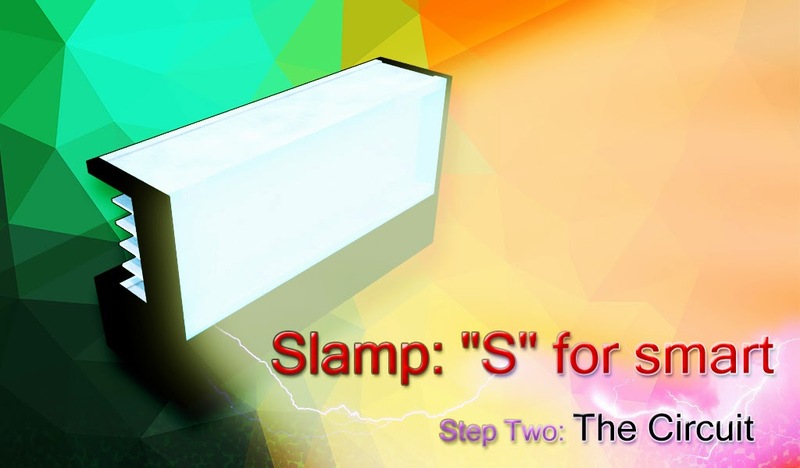 Creativity / Design: Slamp: "S" for smart - Step Two: "The Circuit"
Previously, in the opening of this project called "The Theory", we talked about as we can control two power LEDs with a lead acid battery and some calculation about boost switching theory. Right now we're going to introduce the hardware, that could be different in some particular at the end of this project, but the stock hardware should remains the same. 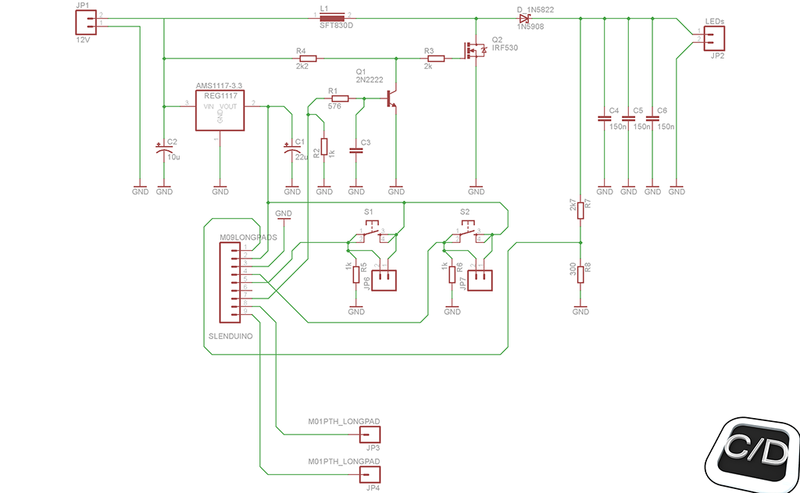 This section examines the PWM signal generation with Slenduino board and the onboard controls. 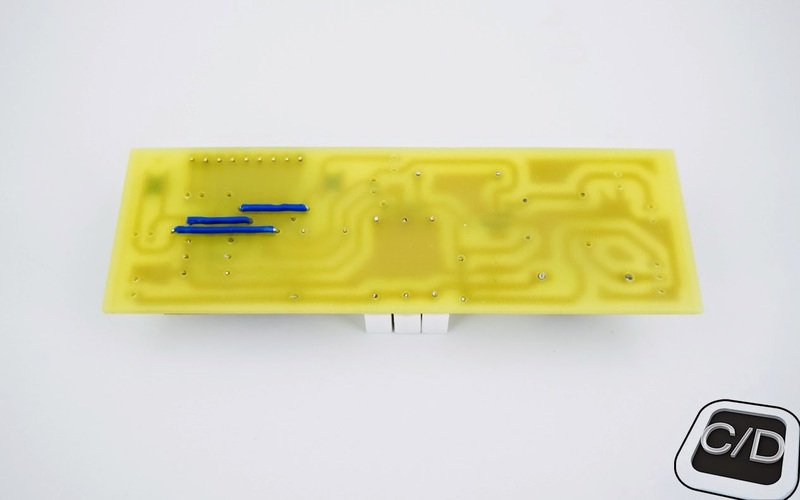 We dispose two momentary buttons with extension pads, but could be even used to stationary buttons, depending on how you program them into embedded software. These two button will be used to select the start routine of board or some working features. In the demo software that we will program in the next article step, they will be fixed to generate a specific PWM characteristic, but as you can imagine, every feature will be established by program. 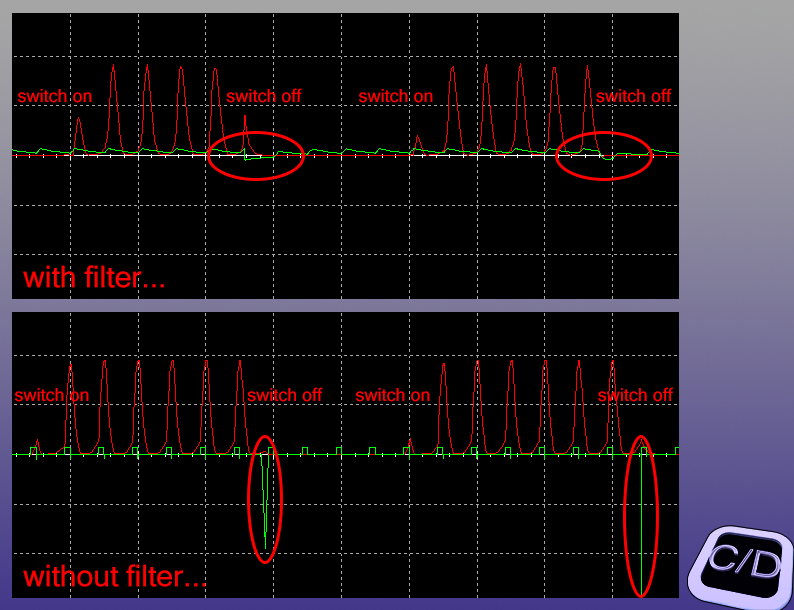 Another feature is the output level reading by resistive divider (the reference is 10% of source voltage). If you want to control the level of output voltage on load, it's necessary to read this dynamically by program. We can repeat this operation even on the input voltage of battery, but we will propose this option in the Section 4. 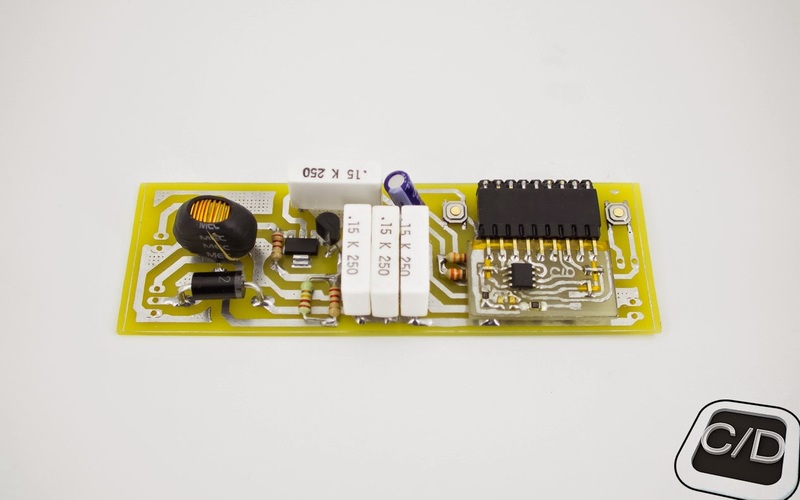 This section examines the power supply of Slenduino board. We want to power our board in different conditions and with different power sources (that is different kind of batteries), so the best way to obtain a right sourcing for our Slenduino is to power the board between 3 to 3.3V. For our purpose we need a low power regulator with the necessary output current capability. We choose the regulator AMS1117-3.3, a devices that has been optimized for low voltage where transient response and minimum input voltage are critical. It can operate with maximum voltage of 18V, it means we can connect different kind of batteries, from lipo to lead acid batteries. The current limit is about 1A, but with our board we can be safe in any operating conditions. We suggest to soldering the C1 capacitor for a better working condition, in many situations, if the input voltage sourcing is rather stable, you can skip the soldering of C2 capacitor. Otherwise, for example in case of another switching power source, it's absolutely recommended. This section examines the level shifting control for the signal that drives the Mosfet and its switching. This is the most critical sector of our circuit, because it directly control the level of flyback voltage over the inductor through the input PWM signal. The nature of this signal, in other words the duty cycle and the stability of itself, it can compromise the correct working of our circuit. After a series of dynamic simulations, we have found a scenario in which after a sequence of fast commutations of the main power supply, it was generated an high reverse voltage at the end of BJT base 2N222. 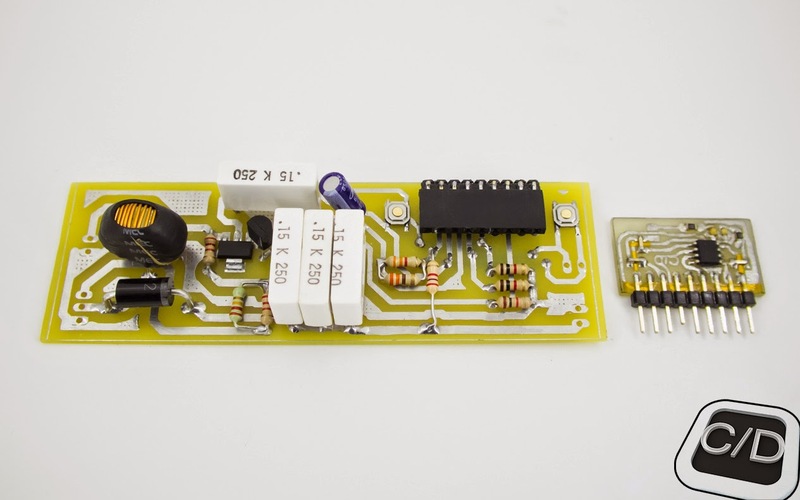 This condition could be too much critical for our circuit, so we have introduced a filter to slowing the pull-down resistor connected to BJT and the abrupt commutation of power switch. This avoid any switching inconvenience on base pin. Follows a representation of this critical case with and without the filter in a comparison of pictures. This prevent the instability in our circuit, when it will power on-off and the damages on Slenduino board that could happen differently. This section examines the onboard extension pins. We have wanted to leave some degrees of freedom for different implementations. Some of these possibilities will be discussed in program implementation and it would be nice if some ideas could comes from you. So, these two pins have exactly this purpose. As we said, it's possible to read the reference of input power source as shown in the Section 1 or to connect a sensor to start another task; the possibilities are only limited to your imagination. In our application, we're thinking to use one of these inputs to write a flash camera application for this circuit. For all about this and other applications we leave you to the next article, in which we will talk about the implementation of embedded program. We leave you to some picture of demo circuit, such as realized in this first release. We just forgot a detail... in the next step, it will concern even the case holder that you can build with some heatsinks (as shown in the covers). These will host the LEDs and the Mosfet that you can't see right now in the pictures, so... don't lose you the next article!